Rare does a sequel actually turn out better than the original. I know that people will argue that it happens more often than not, but that it not the case. Most sequels are hastily made in order to cash in on the popularity of the original. Just look at any horror franchise and you will know what I am talking about. With each and every sequel, the franchise gets worse and worse. Saw I'm looking at you. You may remember the events of the first Evil Dead, but if you don't then you have nothing to worry about because this movie gives you a full recap. Many people, when the movie came out that this movie was just a remake of the first movie because it really isn't made clear that the first fifteen minutes is a recap. We now join Ash (Bruce Campbell) as he fights to get out of the woods and away from the force that killed all his friends. During the struggle to get out his hand becomes posessed, which leads to some of the funniest gags in the movie. This gives Campbell time to prove that he can do physical comedy just as well as anyone else. He has plates smashed over his head, he is thrown all around the cabin, and is almost choked to death before he decides that the only way to deal with the problem is to cut the hand off. Most of this movie, if you haven't figured it out, is played for laughs, but the undercurrent of the movie is pure horror. There are scenes that don't belong in a comedy, but work perfectly here. Take, for example, the scene where Ash's girlfriend's body rises from the grave and dances. This scene would not work in a comedy because it is to grotesque, but here it work because we are watching a horror movie. A lot of the credit goes to director Sam Raimi, who is so confident that scenes like the one I just described will work that when some of the later scenes don't work we just look passed it. Very few directors are confident enough to have the lead character have almost no interaction with anyone for nearly half the movie. That takes guts. 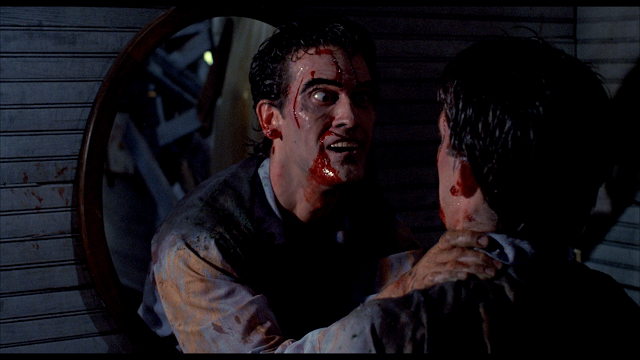 Evil Dead II works because it doesn't just rehash the first movie, but gives us something new. By adding comedy into the mix, Raimi has allowed himself a lot of freedom to expand and the story that was established iin the first movie. Evil Dead II is not just a great movie, but the even rarer type of movie: it's a great sequel. Anchor Bay has given us a nice looking 1080p transfer with an aspect ratio of 1.85:1. The picture looks the best it has ever looked, but I think it could have been a little better. 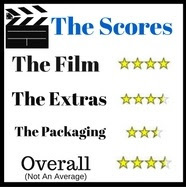 Anchor bay has given us some excellent special features. There may only be a few, but what a strong few they are. 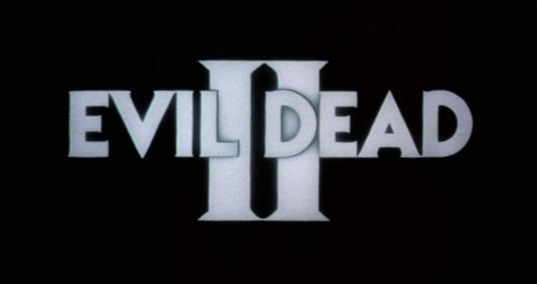 This audio commentary has been heard on every format that "Evil Dead II" has been on (outside of VHS). Some nay complain that the commentary is not new, but it is so good that the information contained in it is almost timeless. This is one commentary that you can listen to more than one time. This featurette is carried over from the special edition DVD released a long time ago. The special effects are covered here, and we get a good insight into how everything was done. Obviously we get to see the original theatrical trailer for the movie. 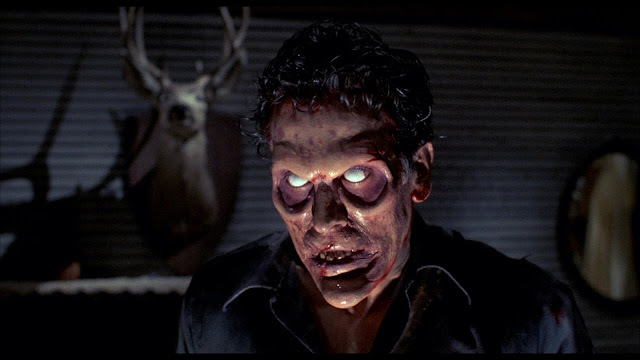 "Evil Dead II" is one of the best horror movies ever made and its high def debut is really good. Maybe when Anchor Bay rereleases this again (you know they will) they will give it the "Ultimate Edition" treatment that they gave the first movie.